A Shaping Bra is a bra that is specifically designed and made to hold collected fatty tissue from the underarm and side area inside the cup of the bra. Repeated use of the Shaping Bra, when properly fitted and worn, will in time result in enhancing the breast shape and size by maintaining the fatty tissue in the cup and the area of the breast. It will provide the best support and control of the breast and the collected fatty tissue, as well as best shape and look. It will provide all that in great comfort. Looking at a Belle Forme Shaping Bra, it may look like most other Bras. But what makes a Shaping Bra different are the details of the design and materials used. Some of the factors that make a Shaping Bra are: wide side panels and wider spaced underwires (both to collect fatty tissue and correctly hold in place), stretch yet firm fabric, fabric layering, strap design, and stitch design and placement. 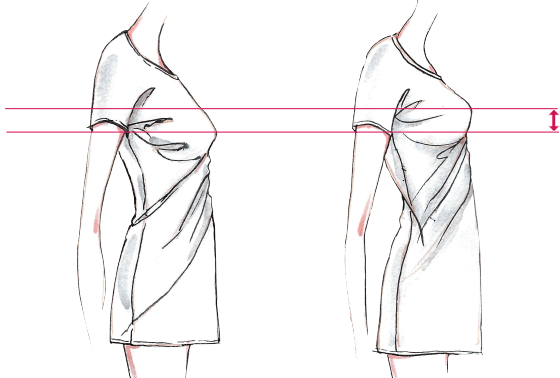 When fitted and wearing the right Shaping Bra, the apex of your breasts should be mid-way between your shoulders and your elbows. This gives a youthful look, and an instant slimming appearance. Also the bra’s wire should precisely encircle your breasts as shown in red, so as to provide maximum support. 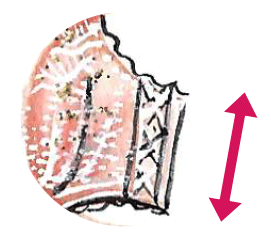 The Wings (Side Panels) of a Shaping Bras usually have wider panels with supportive boning. That ensures the stability of the Bra during your daily activities. This secured fit can be achieved with these wing features, and this fit is an essential part of Shaping Bras as 80% of the bra support actually comes from the wings. Belle Forme believes the Wide Side Panels (wings), together with the well-constructed cups, are two of the most important parts of Shaping Bras that are responsible for keeping the fatty tissue in place and shaping your breasts over time. The collection, push-in-place, and lifting of the fatty tissue and yoir breast will occur simultaneously in a Shaping Bra. When Expertly Fitted in a Belle Forme Shaping Bra, you will be matched and fitted with the right size and, right style of bra, that best works in containing the side bulge in your underarms. It is essential that this area of fatty tissue be properly collected, and placied inside the cup. Many women are concerned about their side bulge, and they believe that it’s just how their breasts are shaped, or just accept to live with it. However, this is not the case and this issue can be resolved with the correct bra and fitting. PS: Continuous use of the wrong size/style of bras will actually contribute to this condition and worsen it. 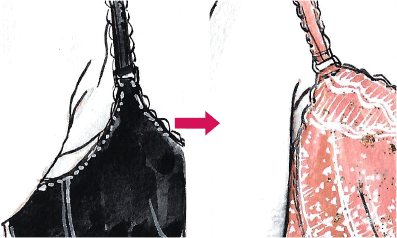 Shaping Bras can help minimize if not eliminate, these unwanted side bulges. Above average width of the Side Panels coupled with solid boning will help keep the Shaping Bra's wings to stay put on your sides to give maximum fit and support.